Minimalist Japanese retailer Muji will reportedly open stores across Canada over the next several years. It has secured its first Canadian location at Toronto's Atrium on Bay, with further locations to follow in various Canadian cities. Known for being innovative and its products being affordable and unbranded, Muji carries various household items, furniture, appliances, stationary and apparel. With hundreds of stores worldwide, it saves money by avoiding locating stores in high-rent areas and spends little to nothing on market research and advertising. Muji's Canadian stores will carry about 3,000 products -- less than the roughly 7,500 carried in its Japanese stores. Muji is short for Mujirushi Ryohin, or no-brand superior items, and was founded in 1980 as the private-label brand of a major supermarket chain (not unlike Canadian brand Joe Fresh). Canada'a first Muji store will either replace Guess Jeans, which recently closed, or locate in retail space fronting Dundas Street West. Click this image for the entire Atrium on Bay floorplan. Muji's first Canadian store will open this December at Toronto's Atrium on Bay. Urban Toronto's ACT7 forwarded us information from the City of Toronto Building Status Application website, indicating that Muji will locate in space C-03 on the ground floor of the retail complex. Atruim's leasing manager was away on vacation last week, so we're awaiting details on which space Muji will occupy in the mall. We initially expected that Muji would replace apparel brand Guess, which recently vacated its multi-level space with a municipal address of 306 Yonge Street. Urban Toronto's soundmuseum, however, notes that new signage indicates that a pop-up Halloween-themed retailer will move into Guess' space, at least until the end of October. 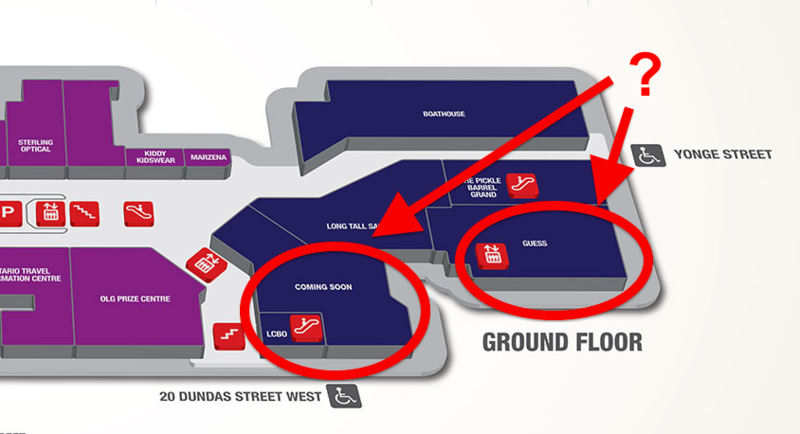 Unless Muji can build its store between the first week of November and some time in December, Muji may actually end up locating in a vacant retail space with Dundas Street frontage, as per the floorplan below. We're awaiting details of the locations of two more Toronto Muji stores, which are expected to open by the end of 2015. We're told that Muji locations will open across Canada soon after. Interestingly, Muji isn't using a Canadian brokerage to secure Canadian retail space. Rather, the retailer is coordinating securing its own Canadian leases. This is according to Uniqlo's Canadian broker, who we initially expected was involved with Muji's Canadian expansion. Muji currently operates nine American stores. Five are in New York City, and four are in California (San Francisco, San Jose, Hollywood, and Santa Monica). Given Muji's choice for its first American stores, we expect that Vancouver will be Canada's next city to house multiple Muji locations. We can confirm, as well, that landlords we've spoken with in other Canadian cities are also very interested in securing Muji as tenants for their properties. We'll update this article when we learn more about Muji's Canadian expansion, including the exact location of its first store at Toronto's Atrium on Bay.